The Seventh Circuit determined that the BIA’s decision was too rigid of an interpretation of the statute. The Court held that even though Mr. Acquaah was found removable for a non-fraud based provision, that because the removal was related to fraud, he was eligible for the 237(a)(1)(H) fraud waiver. The Seventh Circuit remanded the case for the Immigration Court to determine whether the charge (termination of condition resident status on the basis of his marriage to the United States citizen) was related to fraud. Of course, if the Immigration Court did so decide, it would further have to decide whether Mr. Acquaah warrants a favorable exercise of discretion. 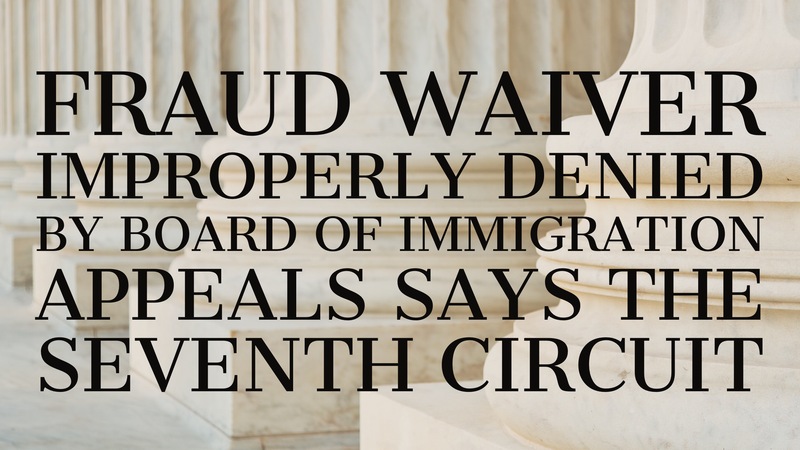 The Seventh Circuit’s decision helps many non-U.S. citizens apply for a fraud waiver. It expands the arsenal of an immigration lawyer defending a client from deportation. It takes the decision out of the hands of the immigration prosecutor, and allows an immigration judge to use discretion to allow a person to remain in the United States, even when there is a legal determination that the person committed fraud, but the person is not charged with being deportable under the fraud provision.